In a nutshell, St. Derfel was a Welsh saint who started out as a warrior in King Arthur’s court (right there we have a problem in the assumption that King Arthur was real, but moving on …). Late in life, he took up his vocation as an itinerant preacher, spreading the Word throughout Wales and establishing churches and ultimately being buried beside his fellow saints, to the incredible number of 20,000 (again, that can’t be right). 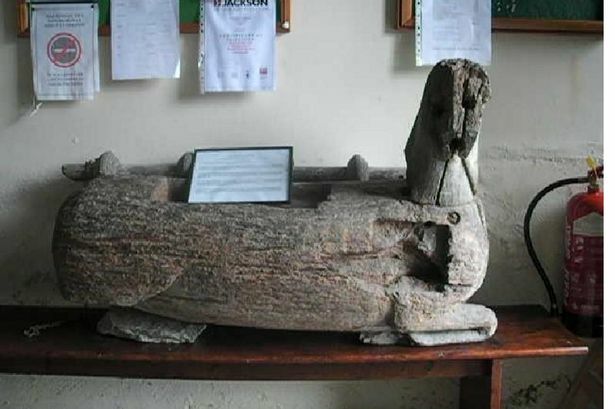 I started out thinking that the carving of the stag, his totem, essentially, and all that remains of his mission, was one of the most obscure pieces of Welsh history possible to find, but after reading some more, there’s a lot more to this story. “For most of Europe, the really important thing was to have a bit of the saint’s actual body. But in Wales it was thought to be wrong to move the bodies of the saints around or to chop them up to provide relics for as many places as possible. Instead, the Welsh valued things that had belonged to their saints – their books, their bells, the staves which supported them on their long treks around the country. Possibly the decorated staff which is now in the porch was a substitute for the one which had been lost. It could be a bit of decorative carving from elsewhere in the church, or it could be a very elaborate version of a pilgrim’s staff. This would have balanced the depiction of Derfel as a warrior with something that reminded you of his career as a wandering saint. The animal with Derfel, though, was in fact not a horse but a stag. Many of the Welsh saints had stags as companions. Brynach’s cart was pulled by two stags. Another two stags helped Cadoc’s monks to rebuild their monastery. Illtud rescued a stag which was being hunted by King Meirchion. The animal became tame and helped to pull a cart. All these stories show the way the saints were expected to be able to control the natural world: the wildest and most terrifying of animals did their bidding. The carving of Derfel and his stag was of enormous importance to the people of north Wales. It was very vividly carved, and parts of it could be made to move. The eyes, for example, could blink. This wasn’t necessarily to deceive people – any more than a modern computer animation at an old building is meant to deceive. But it made the statue more lifelike, and so gave it more power. We also need to remember that the statue was painted – you can still see traces of the red undercoat on the stag. According to Ellis Price, who was sent by Thomas Cromwell to take the statue down at the Reformation, as many as six hundred people visited it on the saint’s day in April. Not that this compares with the tens of thousands (many of them Welsh) who went to Rome or Compostela on the great festival days, but it’s still pretty impressive for a little hamlet in the Welsh hills. The church was built to accommodate these large numbers. The intricately-carved screen between the nave and the chancel had a gallery that could take a choir of sixty people. Their music would have amazed and delighted visitors. The pilgrims who came to Llandderfel brought cattle and horses as well as money to offer to the saint. Ellis Price went so far as to claim that the local people believed the statue had the power to rescue them from hell. He may have been exaggerating here – or it could have been that the priest overstepped the mark in his pitch for offerings on the saint’s day…. So why is the carving of St Derfel’s stag so important? To begin with, it makes us think about the Age of the Saints in Wales. The Welsh saints were an interesting bunch, always awkward, sometimes challenging. They were expected to live in harmony with nature, but also to be able to control it. The stag was Derfel’s companion but it sat submissively at his feet. The Welsh saints were people of holiness but also people of great power, and they could use that power in ways that seem strange to us. Derfel was a soldier: not one of the chivalrous knights of later Arthurian legend but a skilled fighter, someone trained to kill. Cadoc cheated King Arthur over a herd of cattle and blinded King Rhun of Gwynedd. Robbers from Gwynedd who attacked Winefride’s shrine at Holywell all suffered horrible deaths. The statue also makes us think about the lives and beliefs of ordinary people in medieval Wales. They seem to have valued Derfel for his courage and leadership as much as his piety. In a way, a saint who had been a soldier was more holy because he had had to choose to change his way of life. Saints as well as soldiers were expected to be able to protect their people, in the way that Derfel did. The battered remains of Derfel’s stag also make us think about the changes of the sixteenth century. They were traumatic for many people – but they gave us the Welsh Bible and the culture of the chapel and the gymanfa ganu, and they helped to make us the people we are today. Next → Next post: We’re all descended from Charlemagne … and related to each other.